Commissioned to consider the potential for a visible, recognised and authoritative national body for arts and health and its core purpose. It would be: a think-tank; offer advocacy and lobbying; and research and develop work on arts and health. A forum would bring together a group of regional partners working with a shared purpose. It concludes that the majority of contributors consider the principle of a national body to be useful to them, however, it may not cover the breadth of the arts and health field effectively, may just be another layer of infrastructure, and only bring limited benefits. Globe Consultants (2011). Final Report. 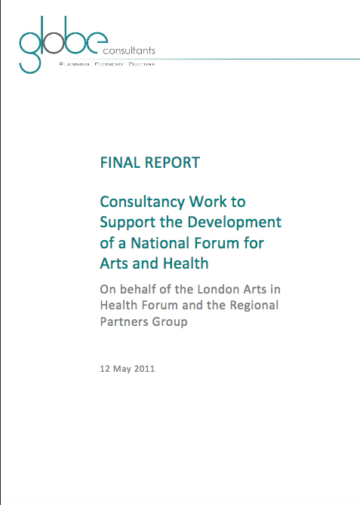 Consultancy work to support the development of a national forum for arts & health. Lincoln: Globe Consultants.